1. Preheat oven to 350°. Line rimmed baking pan with parchment paper or aluminum foil; place wire rack in pan (or use a broiler pan). In small bowl, combine brown sugar and pepper. Arrange bacon in single layer on rack or broiler pan. Evenly sprinkle bacon with brown sugar mixture. Bake 25 to 30 minutes or until bacon is well done. Bacon will become firm as it cools. Cut each slice of bacon lengthwise in half then crosswise in half. You should have 24 pieces of bacon. 2. With rolling pin, flatten bread. Place 2 pieces bacon on 1 edge of each slice of bread. Spread 1/2 tablespoon syrup on opposite edge of each slice of bread. 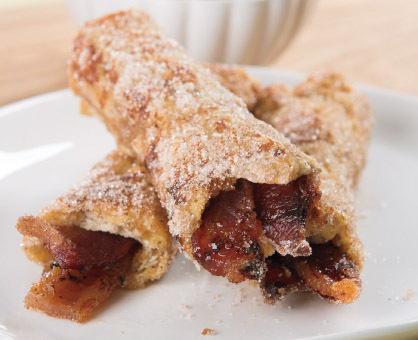 Starting on edge with bacon, roll up each slice of bread to enclose bacon. 3. In shallow bowl, whisk together eggs and milk. In separate shallow bowl, combine granulated sugar and cinnamon. 4. Heat large skillet or griddle over medium heat; spray with nonstick cooking spray. In batches, dip each roll in egg mixture, then place, seam side down, in skillet. Cook 5 to 6 minutes or until golden brown, turning to cook all sides and spraying skillet with additional cooking spray as needed. Immediately transfer rolls to cinnamon-sugar mixture, turning to coat. Serve with remaining syrup for dipping.